According to Microlytics, Inside Information is the "first new classification system for language in nearly 150 years." Unlike conventional English dictionaries, which organize words alphabetically, this innovative program classifies entries hierarchically by categories. The application's seven major categories are Nature, Science and Technology, Domestic Life, Institutions, Arts and Entertainment, Language, and The Human Condition. These are further subdivided into subclasses and subcategories. The subcategories contain the definitions. Inside Information is full of surprises. First, there's the shock of having to pay $119 for an electronic reference tool when a conventional spelling checker or desktop thesaurus costs considerably less. Next, users must resign themselves to giving up a tremendous amount of valuable disk space. The five-disk package gobbles up 3½; megabytes when fully installed. Finally, the application is limited to 65,000 entries, which is small by dictionary standards. If space is a problem, you can exclude all but the Basic Data file, which is needed to run the program and install the other menu items. But there's really no reason to purchase the product if space limitations make it impossible to install the optional Definitions (consisting of dictionary words), Reverse Dictionary (which lets you find a word by its definition), or Explicit Material (containing "sexually explicit language and insulting terms"). The program's desk accesssory lets you access the data in four ways: Outline view, Graphic view, Tree view, and Reverse Dictionary. You can also choose a particular method or view with the pull-down menu. 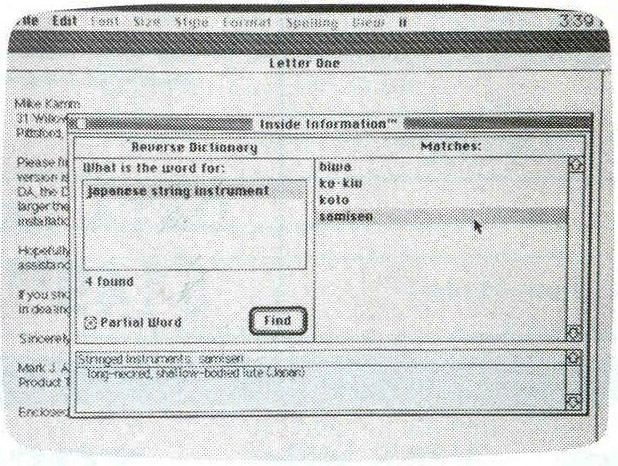 Inside Information from Microlytics includes a unique Reverse Dictionary. The Outline view presents you with the program's seven major word classes. Double-clicking on a particular class calls up its subclasses. Double-clicking on a specific subclass displays categories, and double-clicking on a category yields subcategories. Each subcategory presents a starred word list, and double-clicking on a starred entry yields a definition. For example, Science and Technology leads to Transportation, which leads to Automobiles, which leads to woodie, a "wood-paneled station wagon (slang)." You can bypass all the double-clicking by entering a lookup word. The Graphic and Tree views present alternative visual perspectives on the hierarchical word flow for any currently selected word. When you select the Graphic view, the hierarchy flows from left to right. You can expand or collapse particular categories or levels to see how Inside Information handles classifications. In the Tree view, the hierarchy flows from top to bottom. The Outline, Graphic, and Tree views offer Find, Show Path, and Last Word options. Find searches the dictionary for a particular word. Show Path traces the word through the classification hierarchy. Last Word keeps track of the last 30 words found and lets you easily reselect a particular word from the list. Inside Information's most innovative feature is its Reverse Dictionary. This option makes it possible to find matches for words, partial words, or phrases. The desk accessory conducts a search and presents a list of possible matches. For example, if you type in left side of ship, you'll get back the match, port. You can scroll through the list (which unfortunately isn't alphabetized) and double-click on an entry to call up a definition. You can also switch to any other view to see how the word fits in a hierarchical classification. Anyone interested in organizing the English language into categories of defined words will find Inside Information useful, though its definitions are often terse. The utility does a good job of showing the logical relationships among words. It can even come in handy when solving crossword puzzles. On the other hand, if you're only interested in hunting for a synonym or verifying a correct spelling, Inside Information takes up more disk space than it's worth.